SalonQP 2012 – The UK Watch Event To Visit this Year! SalonQP 2012 is the UK Watch Event to visit this year! That’s right end your year right booking a flight to attend the SalonQP 2012 event at the Saatchi Gallery in London November 8 – 10, 2012. 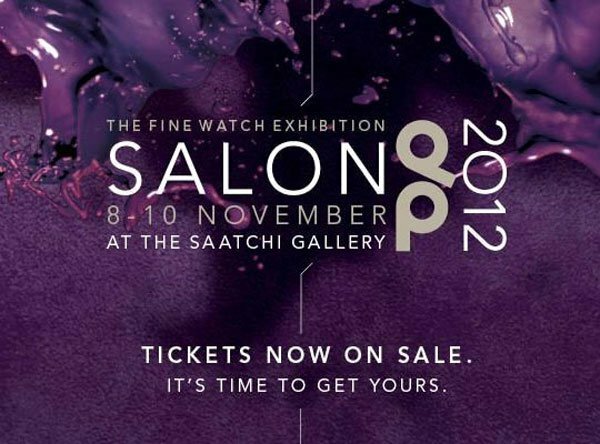 SalonQP 2012 event will be held for its fourth year at the Saatchi Gallery. The event will be hosted by QP Magazine, a UK watch magazine, lead by the magazine’s editor and SalonQP founder James Gurney. An enviable list of who’s who amongst luxury watchmakers will feature luxurious timepieces as well as a list of exhibitors of independent watchmaking brands. The list includes power names like Bell & Ross, Bulgari, Jaeger-LeCoultre, Vacheron Constantin, Christophe Claret, Sarpaneva Watches and Urwerks to name a few. For a complete list of confirmed watchmaker brand attendees go to http://www.salonqp.com/2012-exhibitors/. Guests in attendance will have an opportunity to view rare timepieces, the latest models as well as meet the people behind some the world’s most exciting luxurious watch brands. A limited number of tickets are now available on sale for the VIP champagne and canapé reception on November 8. It is highly advisable to leap on purchasing these tickets today to avoid being disappointed. To book tickets visit www.salonqp.com or call 020 7428 2916. Launching a new watch is TAG Heuer with its MikrotourbillonS. Urwerks will debut a new timepiece as well as British brand Meridian. Frederic de Narp CEO of Harry Winston will also feature a new timepiece at the event as well. In addition to the SalonQP 2012 event, weekly competitions are being offered leading up to the actual SalonQP event. One lucky winner each week will win a prize. This week’s lucky winner will attend a Macarons and Martinis Masterclass event sponsored by Legend of Kremlin Vodka. The selected winner and along with a friend will enjoy whipping up tasty treats with the help of world-class pâtissiers. London mixologist will also teach the winner how to mix and shake the perfect Martini. Also up for grabs is a pair of ticket to one Masterclass, set to take place in Central London on Saturdays in the run-up to Christmas. SalonQP is certainly making this year’s event enticing and well worth the trip to good ole London. Last year’s event included Rolling Stone Ronnie Wood. Don’t miss out on another exciting SalonQP event. The VIP Reception to be held November 8, 12pm-6pm will include a movie at 2:30 pm on George Daniels. A cocktail reception will also be held at 6pm-10pm.